Get a Subscription to Wend For the Holidays! We’ve got a cool Holiday Subscription Offer going on at Wend: Buy one get the second half off. I mean really, what better way to say “Happy Holidays” than by signing someone up for a Wend subscription? Plus in this crazy-over-anything-green day and age, you can’t go wrong with a magazine that’s printed on FSC (Forest Stewardship Council) certified paper and donates 25% of subscriptions to environmental non-profits. Trust me, this is the one gift you don’t want to be without this season. It’s smart, it’s green, and even Sasquatch is doing it. Take advantage of the Holiday Subscription Offer now! When gray and rainy March comes around and you need some travel inspiration, you’ll be glad you did. Print vs. online media: how about both? Working in the magazine world has made me so much more aware of how much great — and bad for that matter — print media is out there. But as the internet becomes more and more integrated in our everyday lives, even excellent print magazines have to make an effort to have an online presence. Nothing will ever replace sitting down on the couch to delve into your favorite magazine, but here are my two favorites whose online content is just as good as the printed version, giving you the best of both worlds. 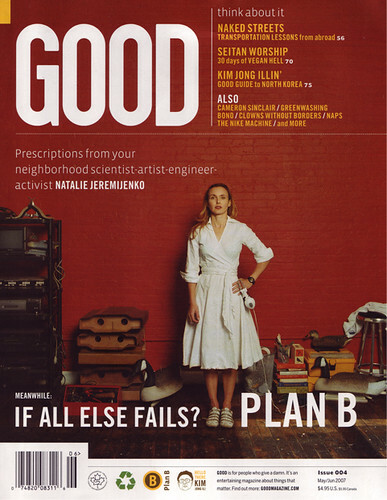 Good Magazine’s whole premise pretty much stays true to its name. Spending just 5 minutes browsing through an issue makes you feel like you too can make a difference. Published every two months, 100% of your membership — you choose the price — actually goes to a non-profit of your choice. In the online world, their blog is one of the most comprehensive, bringing you news from the worlds of culture, environment, politics and art. Ok, Plenty Magazine is another green mag, but this one has solid and informative content on a regular basis. And it’s not just for the devoted environmentalist; there’s a good about of green celebrity gossip and fashion tips to keep us from getting too down about the world state of environmental affairs. And of course there’s always Wend Magazine whose blog is updated frequently with the best of the outdoor and environmental world… but then again, I’m biased… and don’t have a problem with shameless self-promotion!